Editor’s Note– “Around 1965, my mother took a carload of kids along with her to go grocery shopping at the only store in town, the 101 Ranch Market. After shopping, she loaded the kids back into the car and headed home. As she pulled into her driveway out in Ellwood, one of the older kids asked her where the baby was. She panicked, and realized she had left the youngest child at the store! She rushed back to the market in a flurry and found the young boy playing happily in the little rocket kiddie ride in front of the store, oblivious to any danger he may have been in. That oblivious little kid was me. Fifty years later, I still go to that same market and walk right past those kiddie rides five days a week. Having worked there virtually my whole life, this page holds some significance for me. I hope you enjoy it.” In the heart of Old Town Goleta, this little market has been open for business for over half a century. But it hasn’t always been a grocery store. And it wasn’t always in this location…. 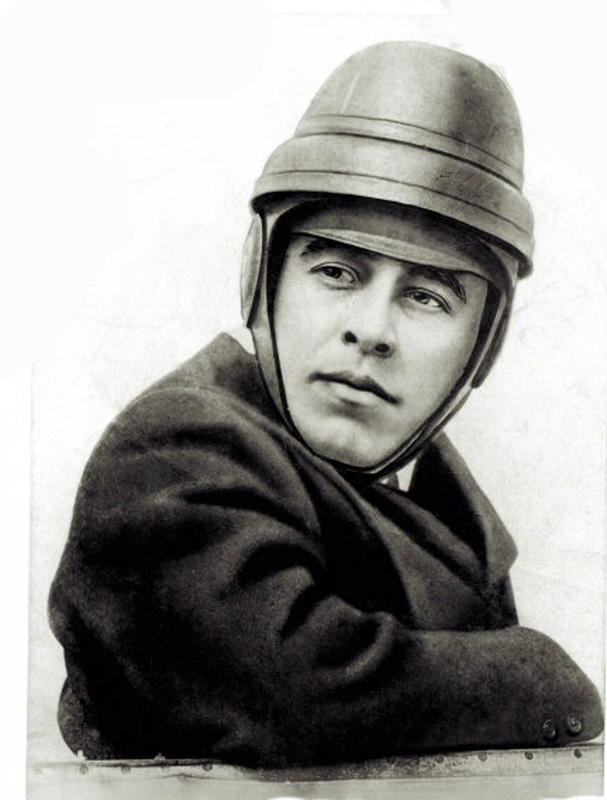 This dashing young man was responsible for the construction of the building that today is known as Santa Cruz Market, but he built it as an airplane hangar. This is Earle Ovington, and he is a legend in the world of early aviation. He was an inventor, an entrepreneur and a successful businessman, but he is best known as the first United States air mail pilot. Ovington moved to Santa Barbara in 1920 and built the Casa Loma Air Field at Samarkand, where the Municipal golf course is today. Around 1928, he built a small hangar on what today is the eleventh tee, and painted Ovington Air Terminal across the front. 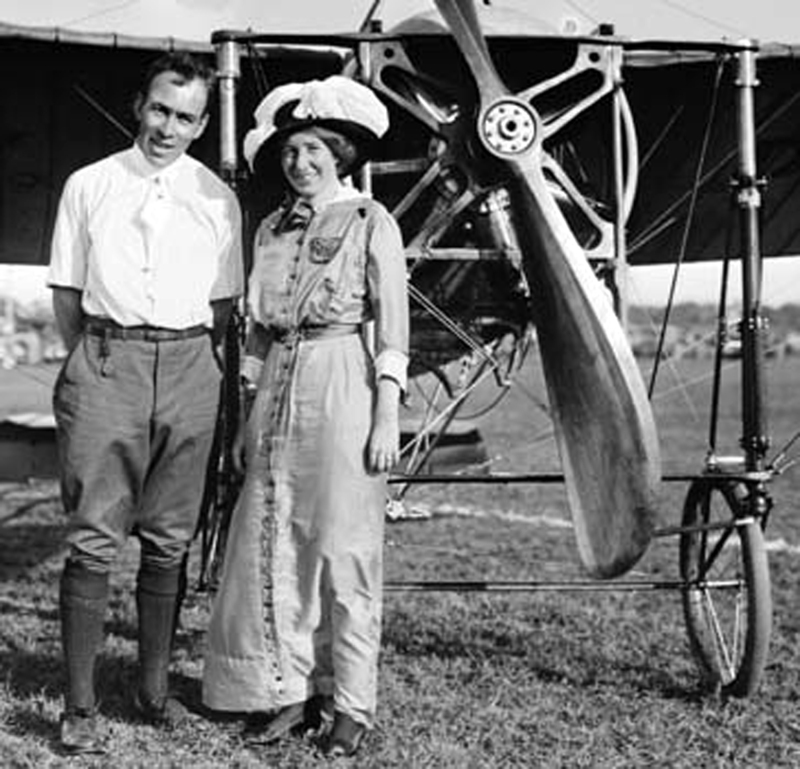 For a while, the Casa Loma was Santa Barbara’s only air strip, and it attracted such aviation celebrities as Charles Lindbergh and Amelia Earhart. The Ovington Air Field soon got a reputation as too dangerous to use by many fliers, as it was not level, riddled with pot holes and surrounded by tall eucalyptus trees, resulting in several crashes. This rare photo from 1930 shows the hangar in the background and Ovington being interrogated by State Troopers after an incident. Despite the hazards, Santa Barbara’s first ever commercial flight flew from the Casa Loma Air Field to Los Angeles in 1931. 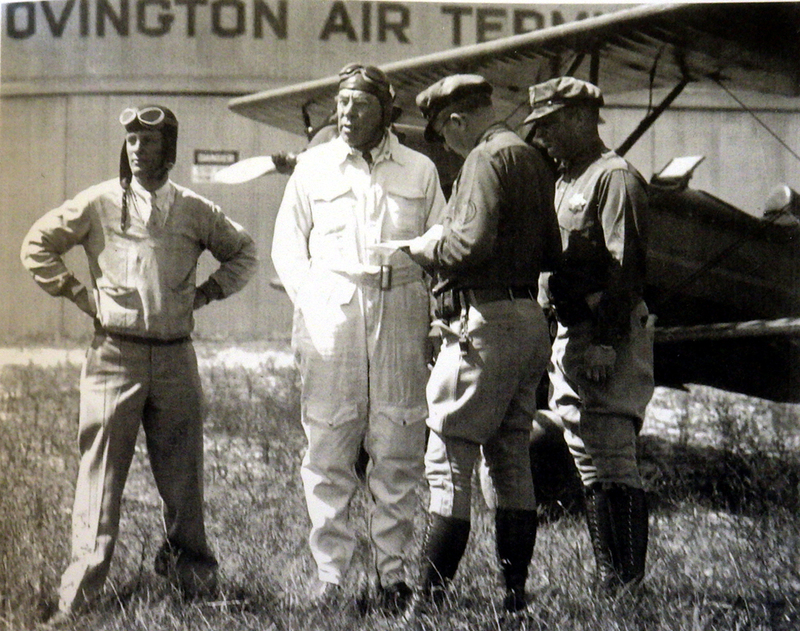 The Ovington Air Terminal officially became a commercial airport, offering round trip fights to Los Angeles for $9.51. The increase in air traffic brought noise complaints and safety concerns from the residents of Santa Barbara, who called for closure of the airfield. 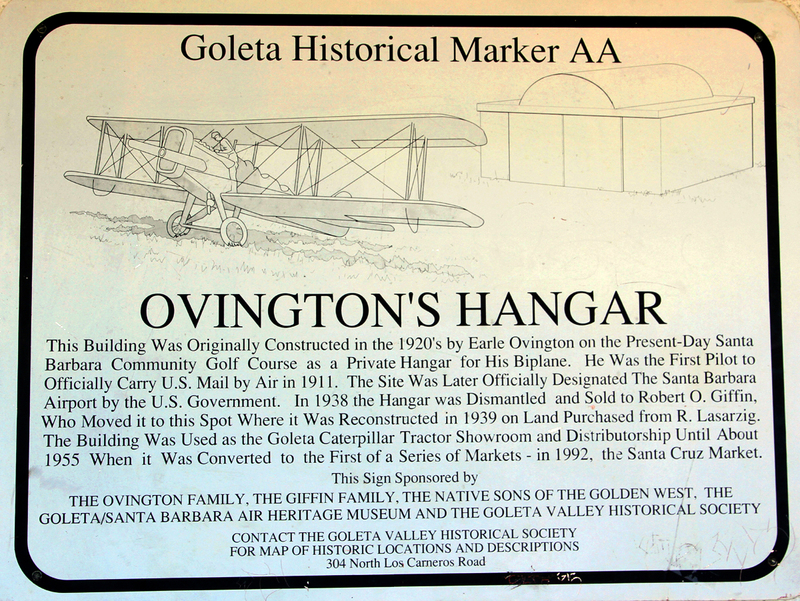 Later that same year, the City told Ovington to shut down the airfield, and decided to make the main airport at the Goleta airfield. A disgruntled Earle Ovington died from cancer in 1936. 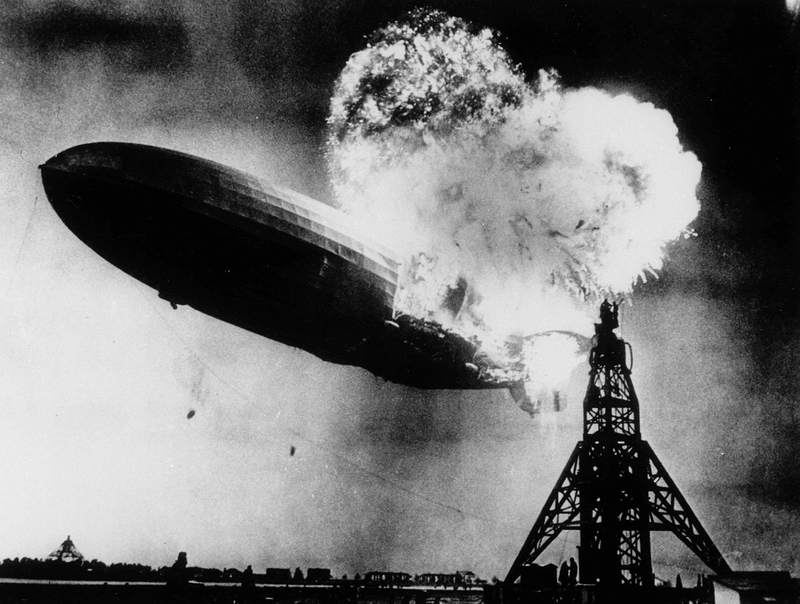 In 1937, the Ovington family rented the hangar to a start up company that built blimps, but the Hindenburg disaster that same year put a quick end to that venture. In 1938, Ovington’s family sold the hangar he had built at Casa Loma to Robert O. Giffin, who dismantled it and rebuilt it at it’s current location, on the corner of Hollister Avenue and Rutherford Street. 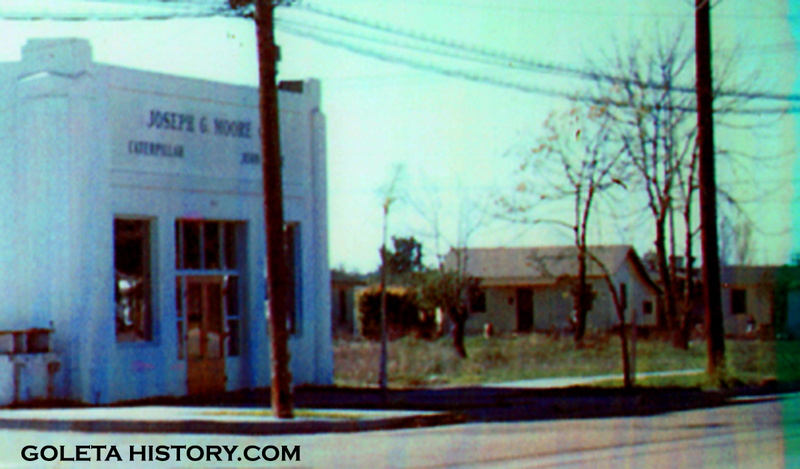 It was rented to Joseph Moore and made into a Caterpillar tractor showroom and repair shop. It operated for about 15 years with just a dirt floor and the big hangar doors were perfect for getting the tractors in and out of the building. 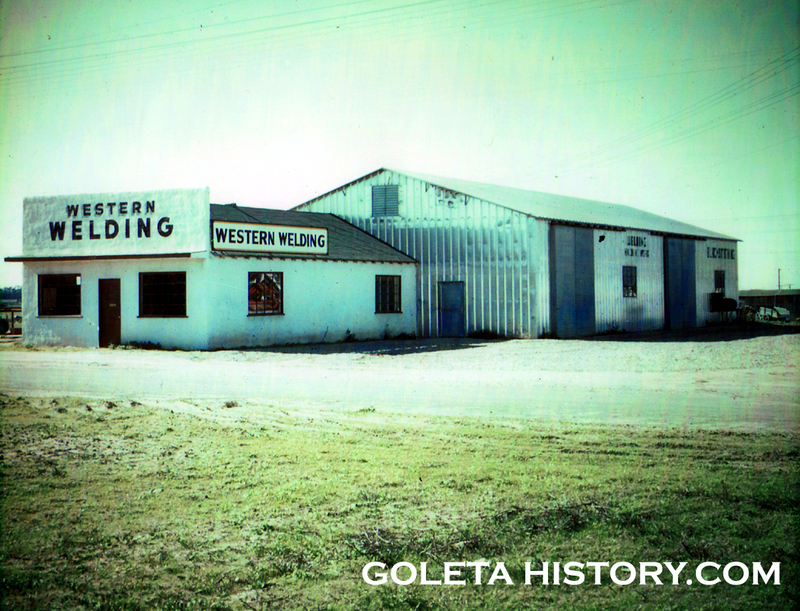 About ten years later, Giffin built this structure for Western Welding, that had previously been operating in the back of the old hangar. This building also survives today as Giffin Rental, right behind Santa Cruz Market on Rutherford Street. This photo, taken around 1949, shows the whole building. The large door on the Rutherford side of the building was formally the front of Ovington’s hangar. Where it says Joseph G. Moore is where Earle Ovington previously had proudly painted his name. Check out where the parking lot is today, a vacant lot and a small house with what appear to be some struggling fruit trees. This view from 1950 shows the tractor shop with the big side door open. 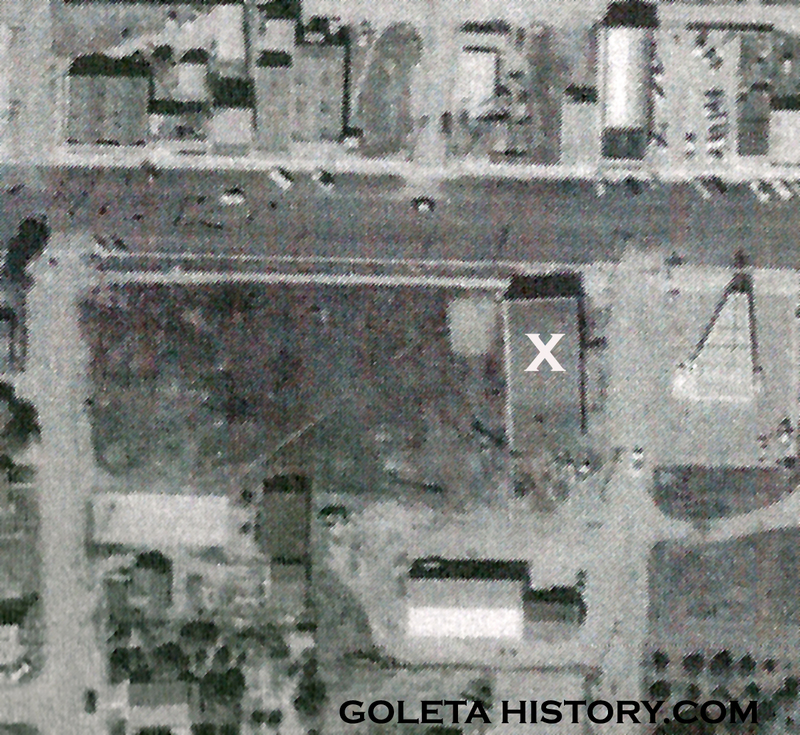 This view from 1952 shows the market,(marked with an X), Western Welding right behind it and a brand new gas station built next door. Also worth noticing is how the cars are parked vertically on Hollister Avenue. A great shot of the Caterpillar tractor shop from 1953, with the big side door open. Note the tractor parked outside and the diagonal parking on Hollister Avenue. 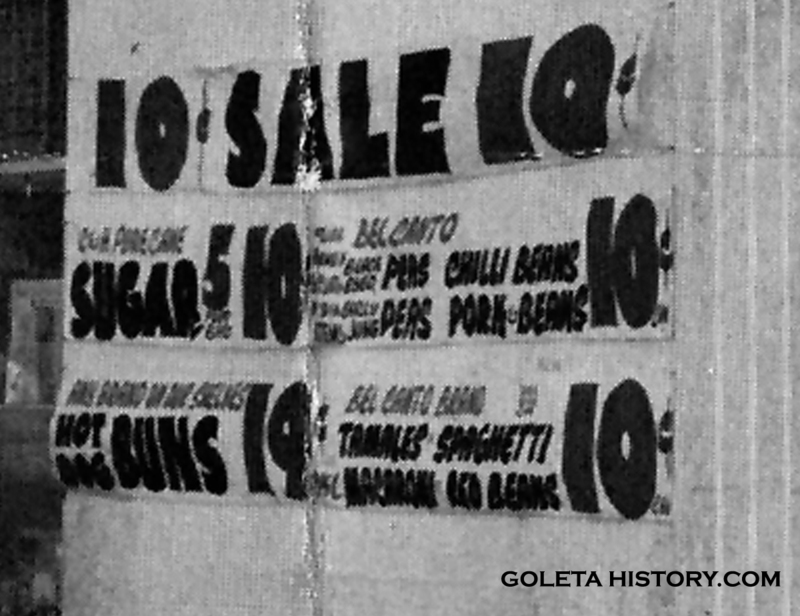 In the mid 1950’s, the hangar became a grocery store. They sealed the big hangar doors on the side, and Robert Giffin’s grandson Tom remembers watching workers with gas powered cement mixers pouring the new concrete floor inside. 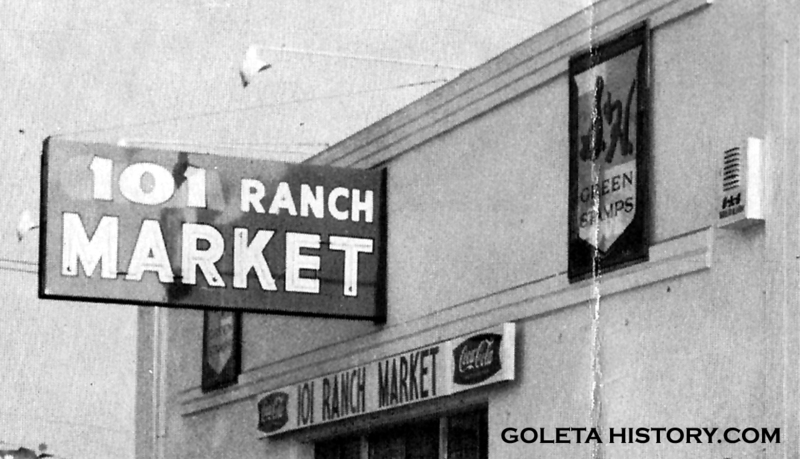 Owned by Jerry Ray, the new 101 Ranch Market became the main grocery supplier in the Goleta area. This photo from 1962 shows a corner of the parking lot, that appears to still be dirt. Also fun to note is the 10 cents sale! A five pound bag of C&H sugar for 10 cents? Wow. 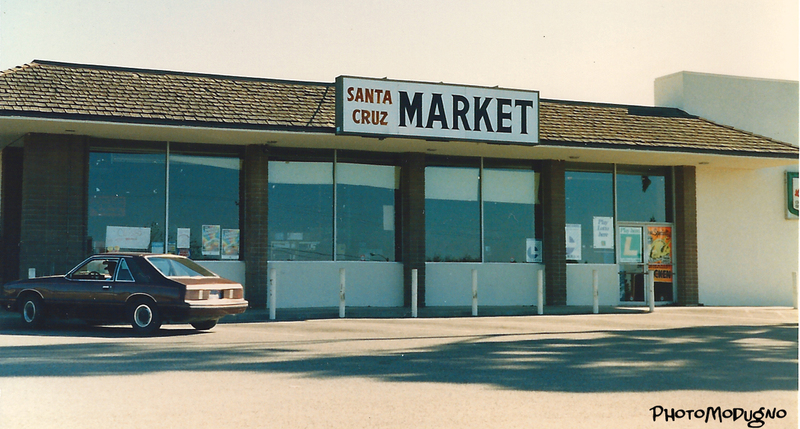 Today, Santa Cruz Market still uses the same sign with the same neon on the “Market” lettering. The S&H Green Stamps sign remains today, gets lots of comments from customers and is a fun reminder of a simpler time. 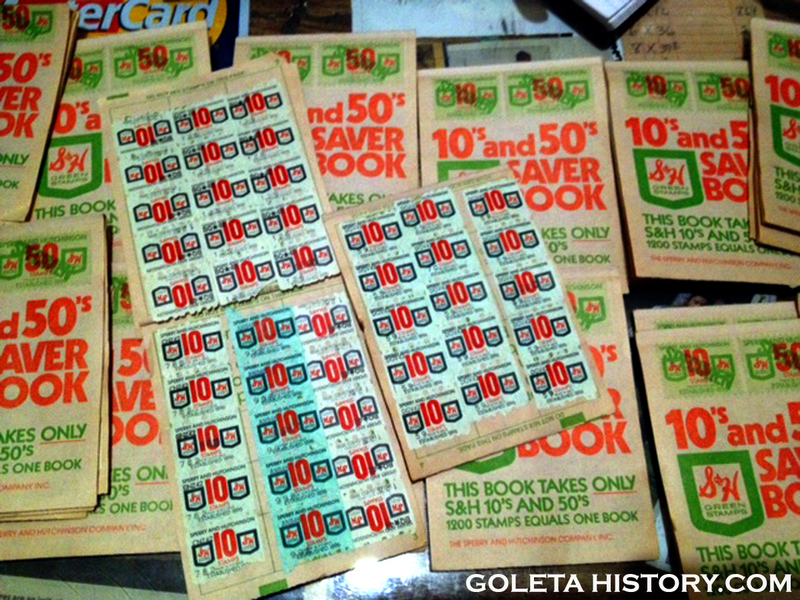 S&H Green Stamps were a big attraction for years, collected by customers to redeem for merchandise at the S&H store. Gallons of saliva were spent filling the books up. 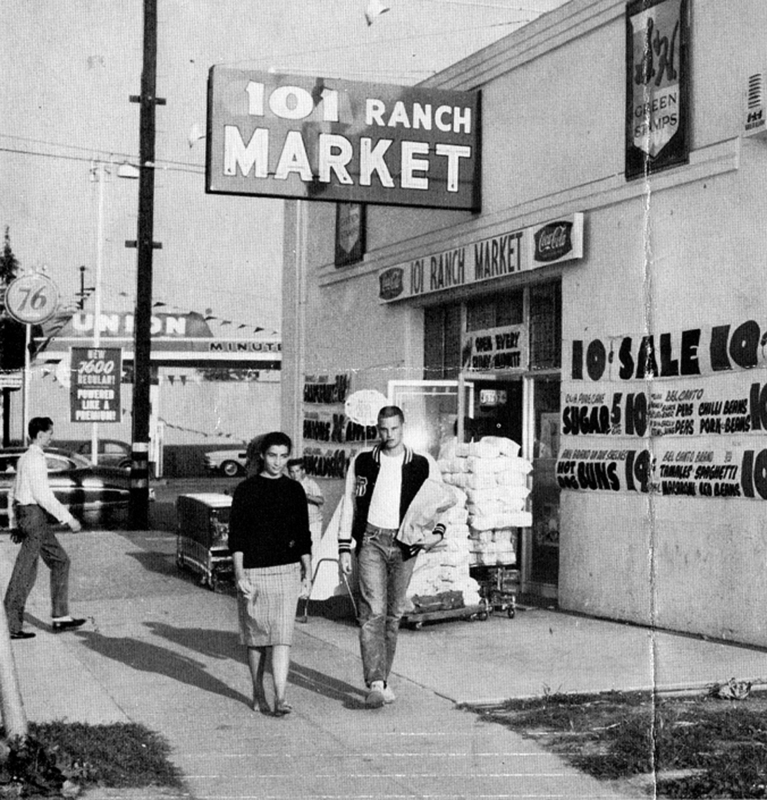 The original Ranch Market logo was a simple oval with the slogan “Save everyday -the Ranch Market way”. 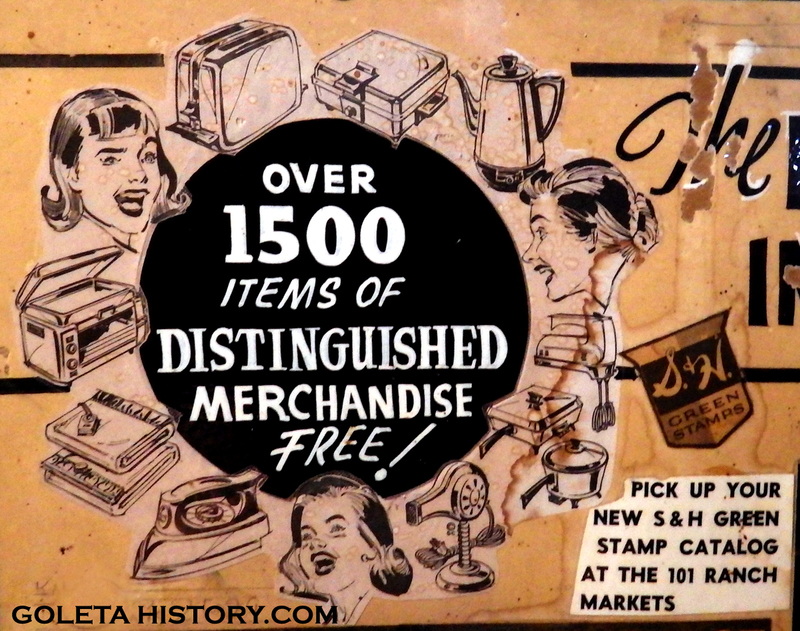 But it was soon replaced with a more stylish design, and the much catchier phrase, “The friendly store that saves you more”. 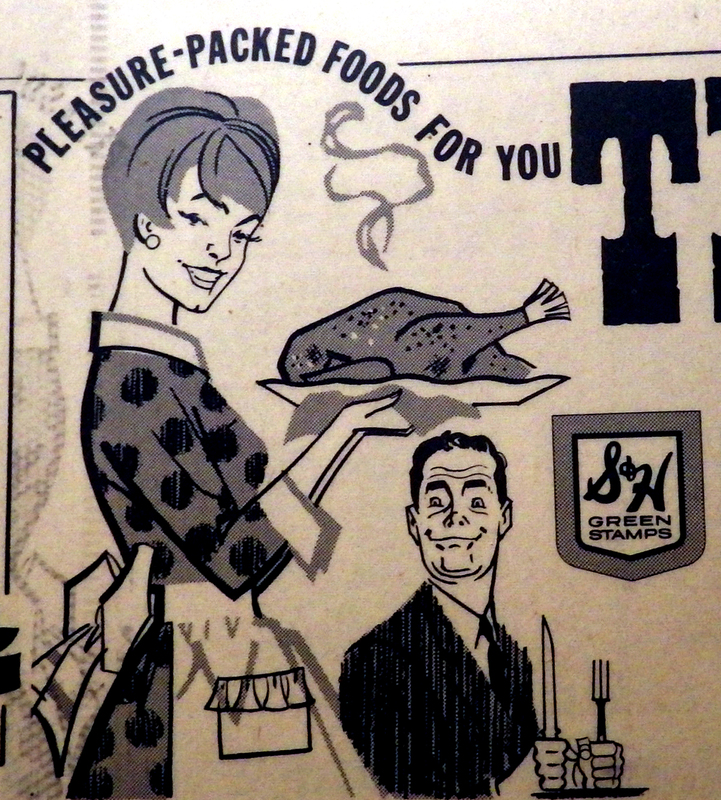 The same logo that Santa Cruz Market still uses today! 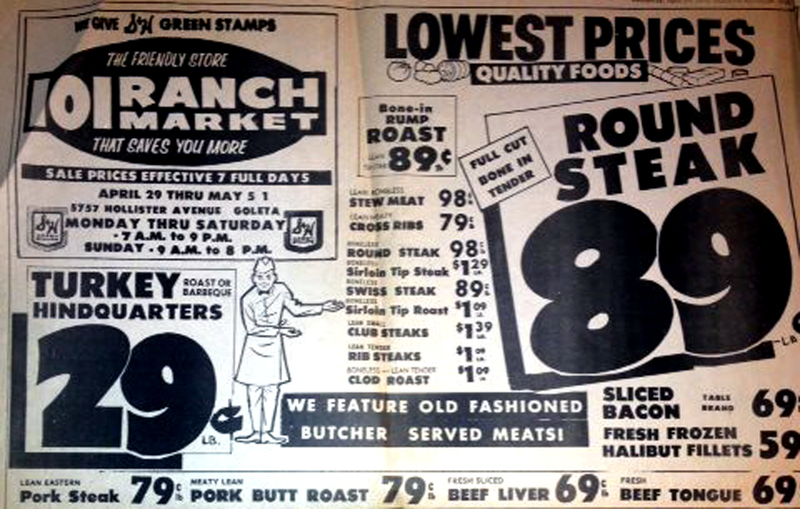 The owner of the Ranch Markets was an aggressive and creative advertiser, with large ads in the paper and lots of fun graphics. The Ranch Markets also held occasional promotions, like this autograph signing by Los Angeles Dodger pitcher Ron Perranoski, fresh from his 1963 World Series win. A pretty big deal for little old Goleta! 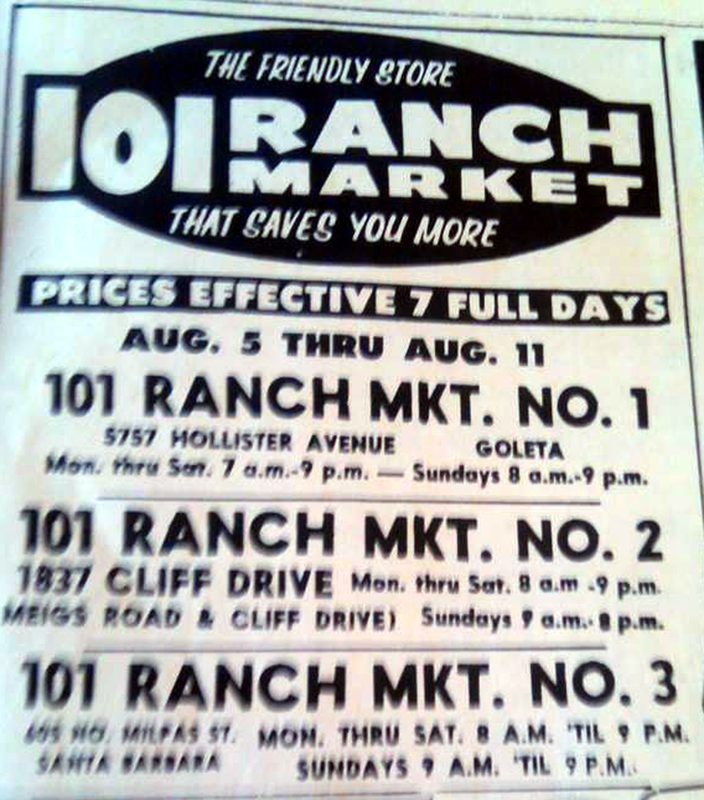 At one point, 101 Ranch Market had several locations. 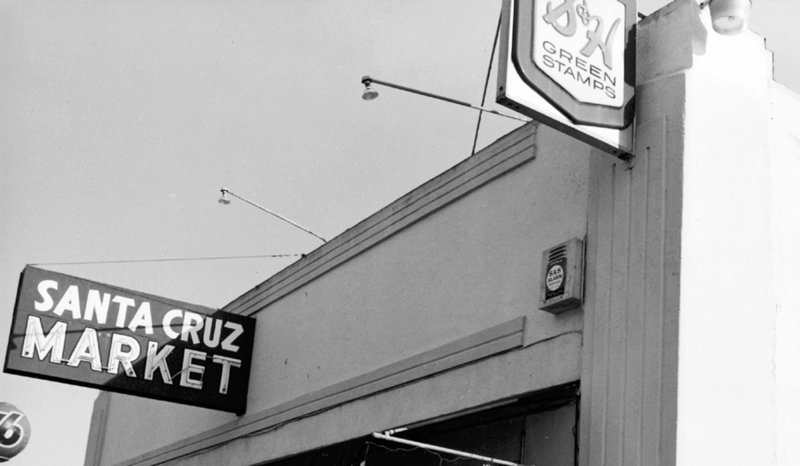 These three locations became Santa Cruz Markets when a wealthy investor named Irving Bomash bought them all in the early 1970’s. 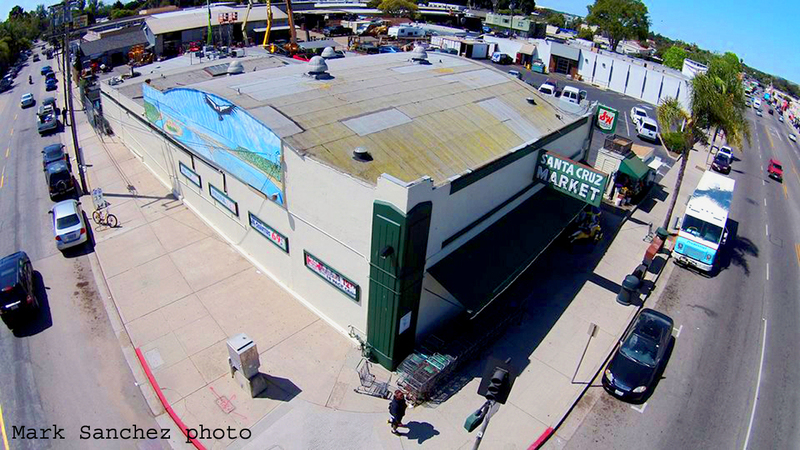 The Cliff Drive store is now Lazy Acres and the Milpas Street location is now Chapala Market. In 1980, Mr. Bomash decided to get out of the grocery business and an employee was offered the chance to buy two of the Santa Barbara stores. Ralph Modugno was born in 1923 in Sylmar, California, the son of Italian immigrants, and had been in the grocery industry since he was a boy. 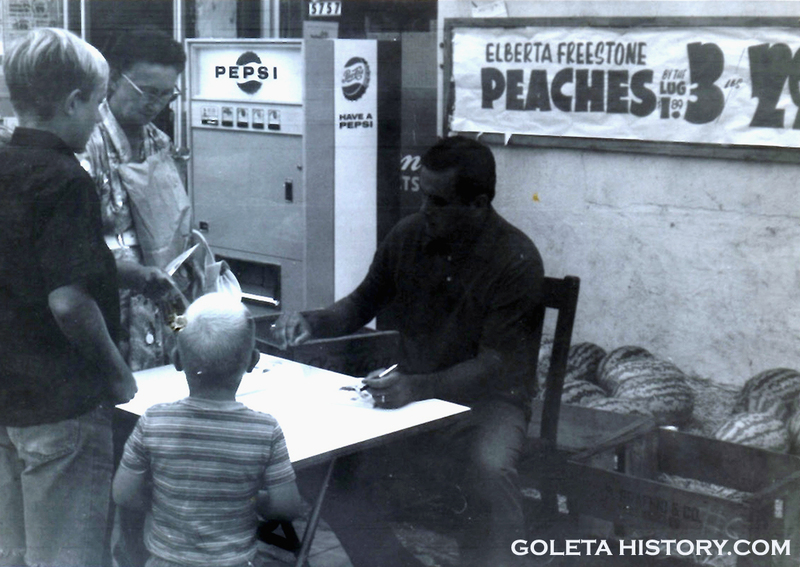 He came to Goleta in 1963 and worked in several different grocery stores around Santa Barbara. Ralph was a supervisor for the Santa Cruz chain when the opportunity arose and he was more than eager to own his own store. 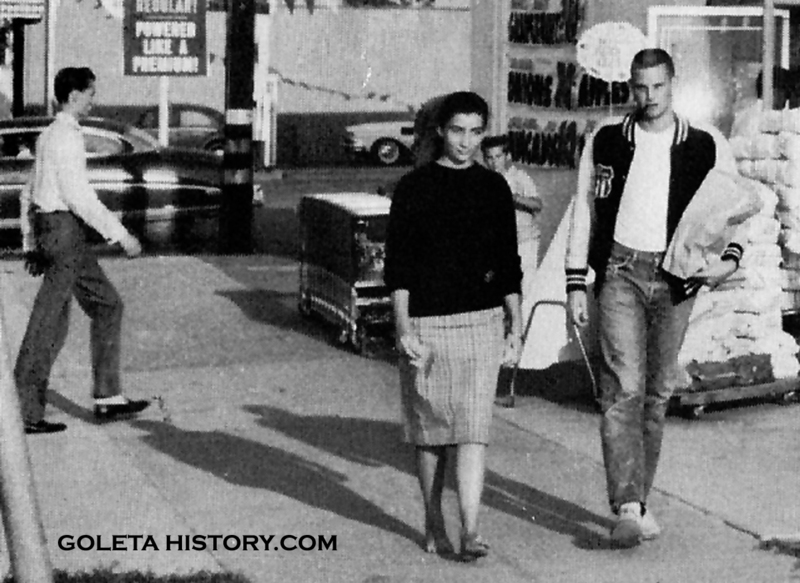 Modugno purchased the Mesa store and the Goleta store, kept the Santa Cruz name and kept the same staff. 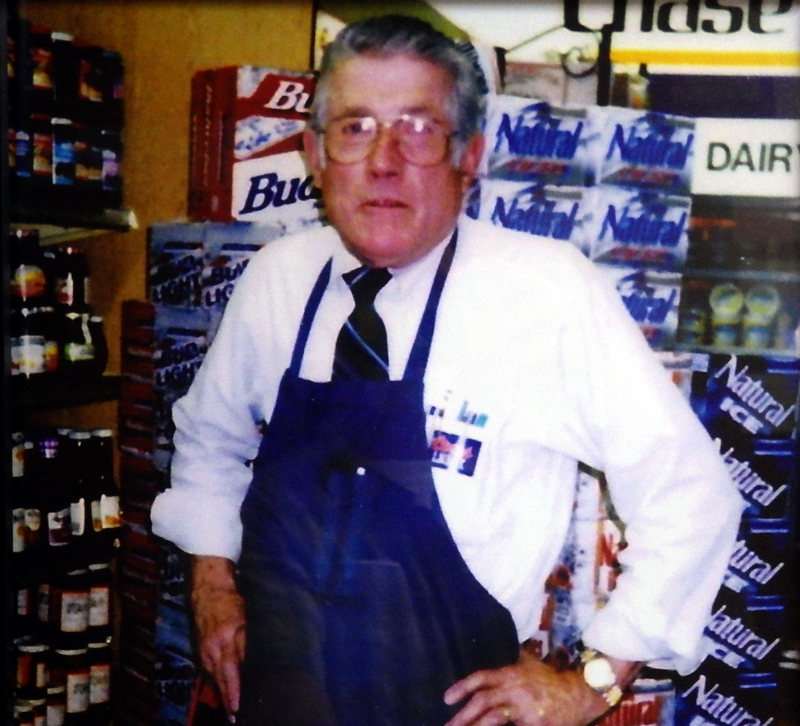 Joseph Kunze, a Goleta native, managed the Goleta store from 1972 to 1997 and was loved by the community. 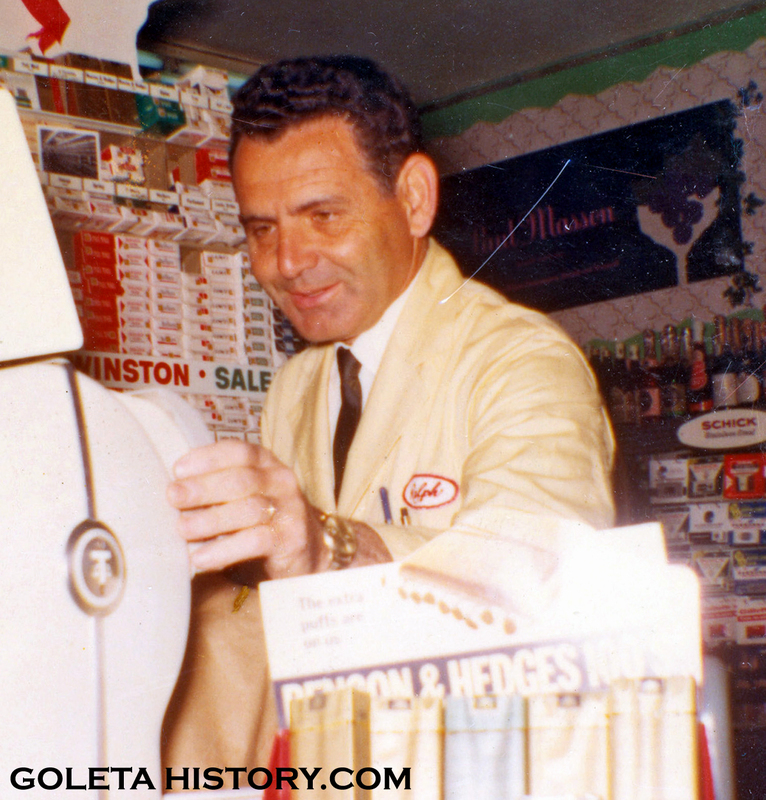 Ralph managed the Mesa store himself and kept Kunze as the manager at the Goleta location. Modugno worked with his family in his own grocery stores for the rest of his life. 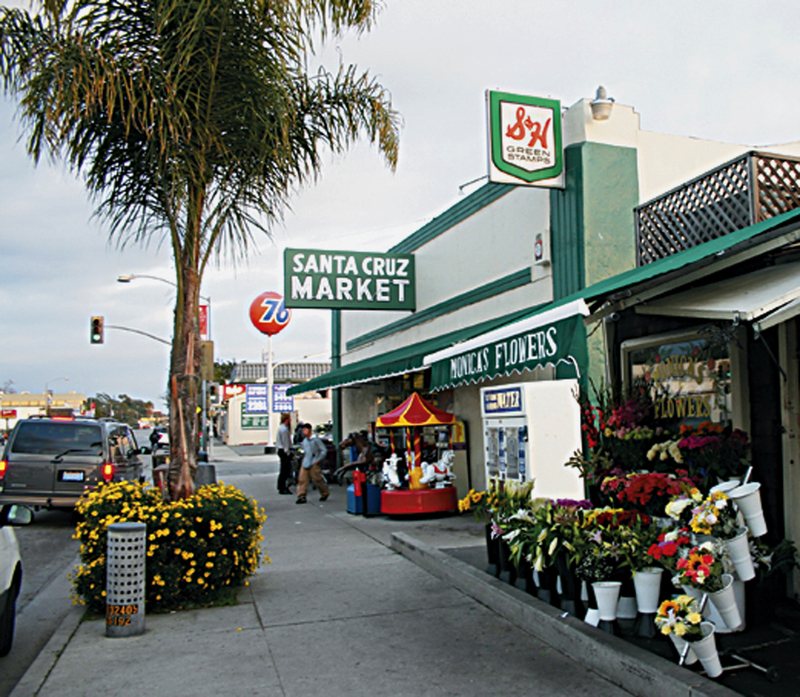 As the neighborhood in Old Town became more Hispanic, Santa Cruz Market changed with it, catering to their local clientele. This historic building is coming up on 100 years old, but it continues to serve the community of Goleta in a useful way. 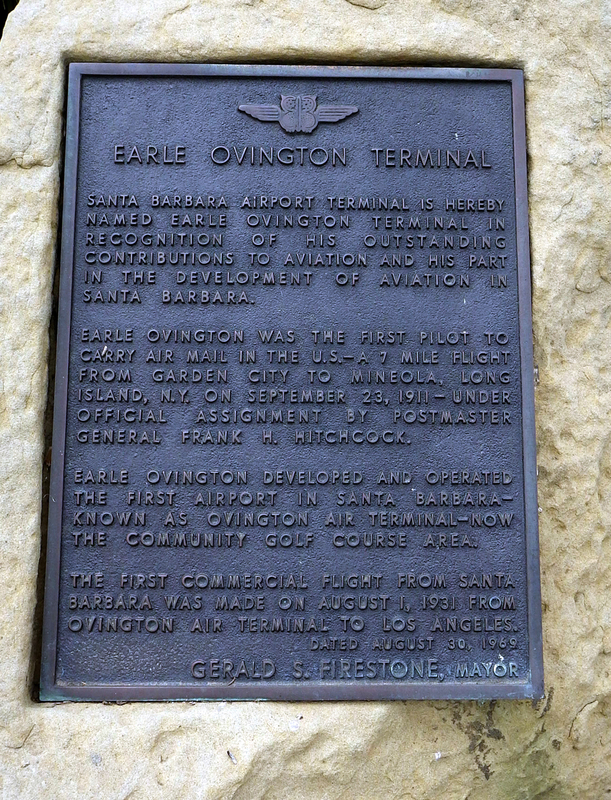 In 1969, the terminal at Santa Barbara airport was named the Earle Ovington Terminal in honor of his contribution to aviation in Santa Barbara. This plaque is in front of the terminal today. In 1992 this plaque was mounted on the front wall of Santa Cruz Market, giving a brief but accurate summary of its historic significance. Recently, the building itself became a canvas for a local artist to recreate a scene from Goleta’s past. Where Earle Ovington once had his name painted across the front of his hangar, Larry Maser painted a condor soaring over Mescaltitlan Island and the Goleta slough. 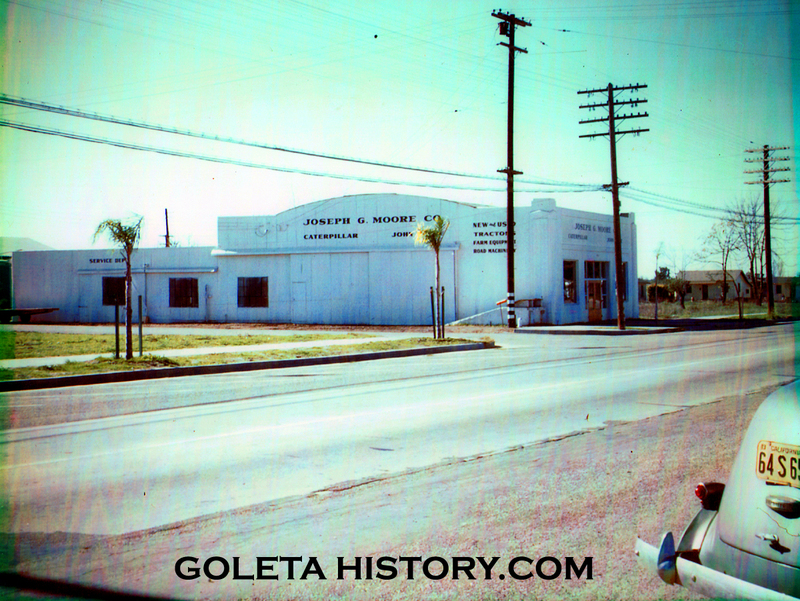 A fitting tribute to the history of Goleta on a building that played a big part in local history. 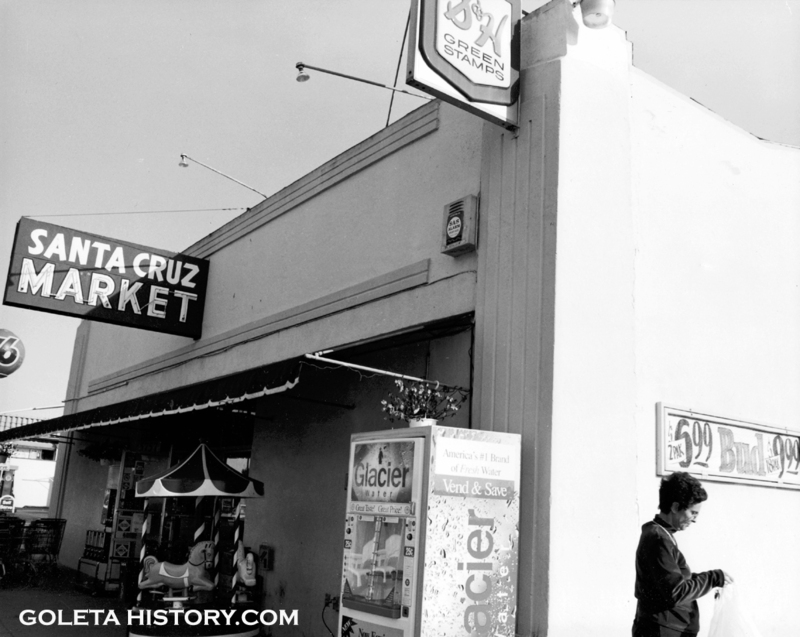 So the next time you’re in Old Town Goleta, be sure to check out Santa Cruz Market, the first commercial air terminal in Santa Barbara’s history! 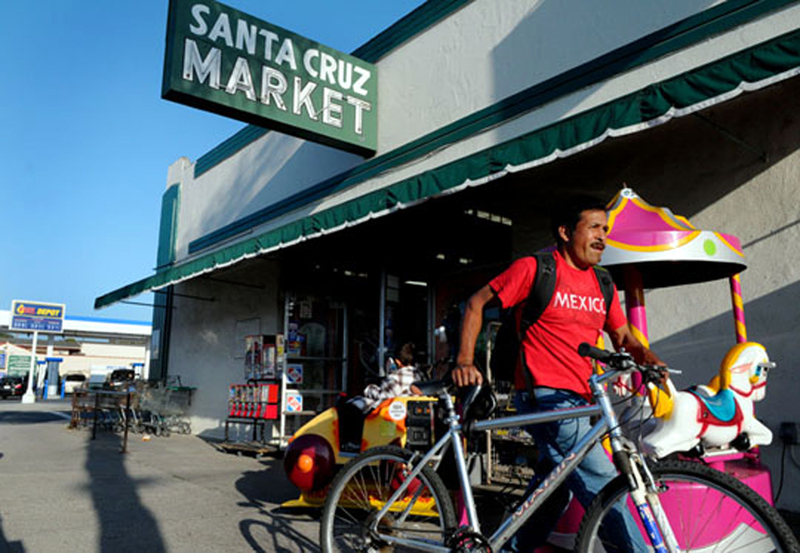 Just read the article on the Santa Cruz Market posted to EdHat which led me to your website. I want to compliment you on the content and design of it and I look forward to reading your other Goleta historical accounts. This is a subject I am interested in as I live in the old John Troup home that was built around 1905 on the George Edwards Ranch at the corner of Hollister and San Marcos Rd. Originally part of the La Goleta Rancho land grant, Edward’s father purchased the land from the estate of Daniel Hill after his death in 1865. Other noted people in Goleta’s history who purchased parcels of Hill’s property at that time include Joseph Sexton and J.D. Patterson. George Edwards hired John Troup Sr, a recent Scottish immigrant, to manage the ranch. The ranch changed hands in the 1920s but the Troup family remained, with either John Sr or Jr managing it up until John Troup Sr’s death in 1957. Their original house burned in 1903 and the house I have lived in since 1986 was built to replace it. The exact construction date has not been determined but it is believed to be between 1903 and 1906. My wife and I have raised our family here and I have managed the surrounding wholesale nursery, San Marcos Growers . Very interesting history, thanks for sharing that Randy. I hope that area can remain agriculture for years to come…. 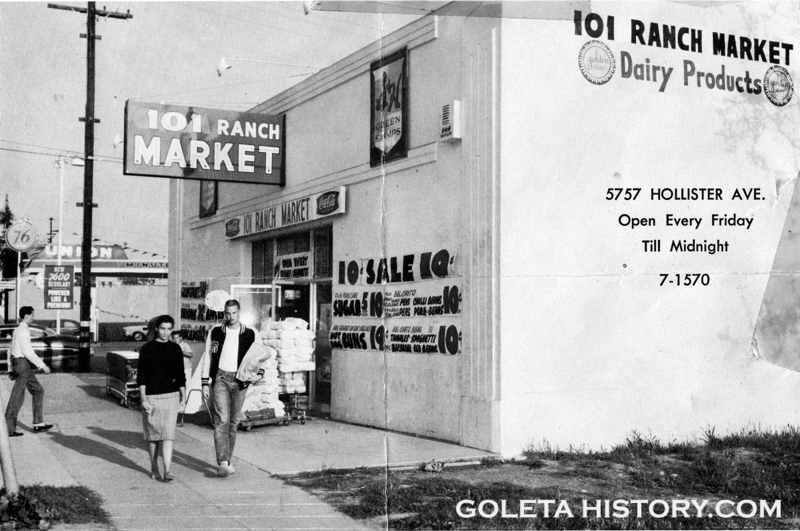 Hi Tom, I’ve become a big fan of your articles and of Goleta History over these past few years and this was another great story but I’m left wondering who owns Santa Cruz Market today. I think it’s you but you didn’t say that. I heard your band playing at Summer Music Concerts when volunteering at GVHistorical Society so are you a market owner, a musician, a surfer or all of the above. Keep doing what you’re doin’ and I wanted to add after Randy Baldwin’s interesting note that I have a wonderful un-finished documentary on the Pagliotti family, old Italian poor immigrant parents who’s home still stands and as of few years ago the 5 girls and 1 boy were still alive and I got the gals on film, they were incredible story tellers you might be interested in. In another article you did on the San Jose Wine Co., it reminded me of the Pagliotti dad (I think Joe, somehow distant relation to some of the Cavalettos) also made wine on his small lot and they grew their own food and slaughtered their own animals for meals. No indoor heat or running water, the mother sewed all their clothes out of flour sacks and shoes were handed down. Their blown up photo cut-out is on display at the Education Center at GVHist. Society in the old packing barn that the Cavaletto’s contributed to updating and preserving local Ag history if you haven’t seen it, probably have. Anyhow, thanks for all your work and dedication, and looking out for the old gas station which I’m sure will be a wonderful Goleta cornerstone when all’s said and done. I can’t wait t read some of the posts I’ve missed! P.S. I forgot to add that I only saw your post when I wrote to Ed @ Edhat to say that the server was not working for Sunday’s paper, my favorite of the week, and one could see the articles but you couldn’t open them and when I saw you and Billy Goodnick had posts I just had to see them so thankful to Ed for sending to me. I wonder if your article shouldn’t be re-posted as I don’t think others got to see it either during the shut-down. I suspect many did not have that opportunity. Wonderful details and the photos are terrific (and it probably took some work to track them all down). Thanks for the great post! Great job Tom. You have a knack for this. By the way are you related to Susan who went to Saint Raphaels school. 64-68 I was in that class. The first to graduate from then brand new school. Thanks Mark, and yes, that’s my sister! Thanks for the history Tom. 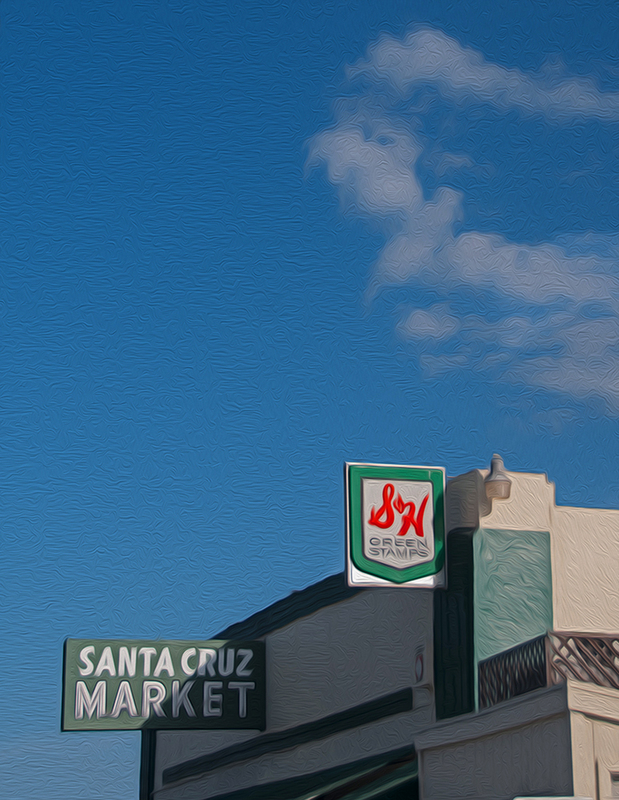 About that Santa Cruz market. 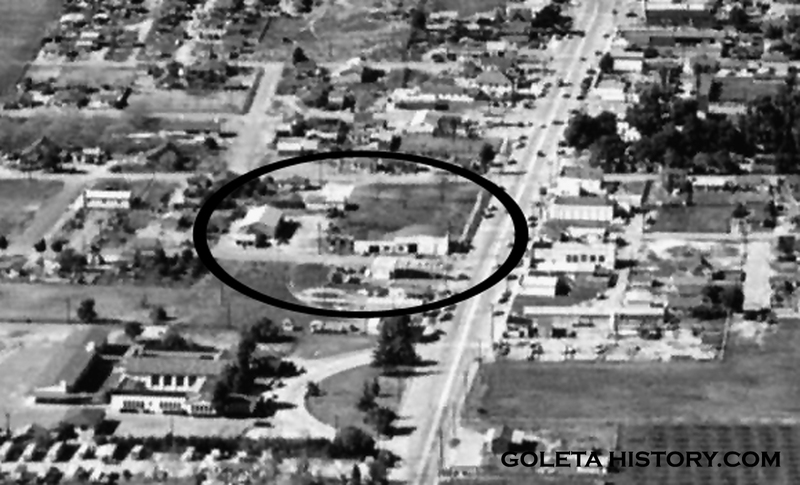 There is a picture where it shows Goleta Union school and the old trailer park. In the seventies I used to deliver the paper there. My last stop was Joe Kunze house at the time only Toyota was there ,beyond that open field and a little trail that went to Joe’s house. Rest in piece Joe. Just wanted to share. Thanks Charles. I remember that old trailer park as well. Used to collect shopping carts in there….